So why BBQ? “Because Bill’s really good at it,” Krimm says. Coleman’s wings are dry-rubbed in a twangy spice and smoked for 2 1/2 hours before being quick-fried and then rubbed again. Anderson swears by the apple cider sauce, but I prefer to eat them dry, dipping them only in a side of blue cheese. The preparation method for the brisket involves a 50/50 pepper and kosher salt mix, and 12 to 13 hours of smoking overnight, because Coleman tries “not to get too fancy.” I sample the brisket with sprouts that are glazed in a delicious honey-sambal (a “turned-up Sriracha”). It goes well with the brisket’s perfectly juicy caramelized fat. Anderson, a silver-haired, bearded man with two colorful tattoo sleeves, explains the menu items, his voice booming through the space as ’90s rock hits like “Learn to Fly” by the Foo Fighters plays in the background. Cinder makes all sauces in-house and has a partnership with local company Gordy’s Pickle Jar, according to Anderson. 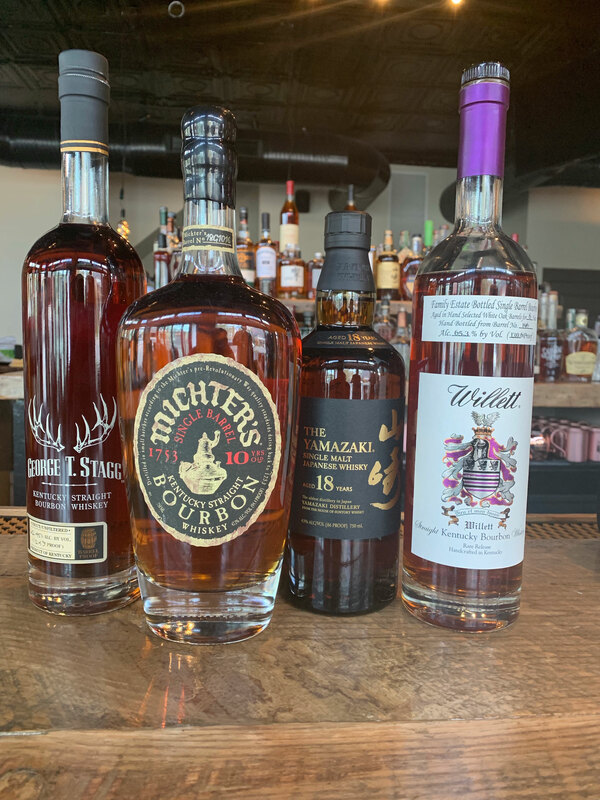 The bar has another partnership with Willett Distillery, a Kentucky-based bourbon maker. The partnership allows the bar to serve their bourbons at lower prices, the owners say. A pour of Willett’s Johnny Drum goes for $8. Despite being a BBQ place, there were concerns over potential vegetarian options. Krimm and Anderson tried to convince Coleman not to put pork in the collard greens, but Coleman successfully argued that they just wouldn’t taste the same. (If I have to pick sides, Coleman is correct here.) But Cinder will be offering a cauliflower dish coated in brown butter, cilantro, lime and pumpkin seeds. It’s the fourth life in a decade for the corner storefront. First it was a beauty supply shop (shuttered), and then it was a convenience store (drug bust). Wine bar Ruta del Vino took over in 2016, but barely lasted two years. Cinder will have TVs for showing sports, but it won’t be a sports bar exactly. “We won’t have pitchers [of beer],” and the sound will not be on for the games. Bill Coleman came to the BBQ business in a roundabout way, serving in the Marines before retiring in 1997. Because of his logistical skills and penchant for feeding masses of people, I ask if he was a quartermaster. “No, I was a grunt,” he says. He likens opening a restaurant to a battle, noting that you can prepare all you want, but you won’t know all the challenges until the fighting (eating) starts. After the Marines, Coleman took a job at Home Depot, where he remembers one day suddenly waking up on the ground surrounded by paramedics. On the mend with a fractured shoulder and other broken bones, he began making barbecue sauces just to keep his mind occupied during the arduous rehabilitation process. His employers at Home Depot added him as a vendor, and from there his pitmaster days were soon to come. As cool as it sounds to own a restaurant, Krimm, lamenting late nights and early mornings, admits it’s a huge commitment of time and money. Towards the end of my visit, a young woman walks by the open windows outside and sheepishly asks Coleman if she can take two flowers from one of the beds sitting there. “Sure,” Coleman says. She walks away after telling him how excited she is about the grand opening. Krimm, looking up from a conversation with one of his employees, asks Coleman if he just give away their flowers. Cinder opens April 13 at 800 Upshur St. NW. Get there: Georgia Avenue-Petworth Metro, green and yellow lines.